Poker After Dark’s exciting comeback season continued this week with a “Femme Fatale” edition of high stakes cash streamed for viewers on PokerGO. The rare all-ladies cash game featuring stakes of $100/$200 drew some fierce competition, pleasant table talk and amazing poker. 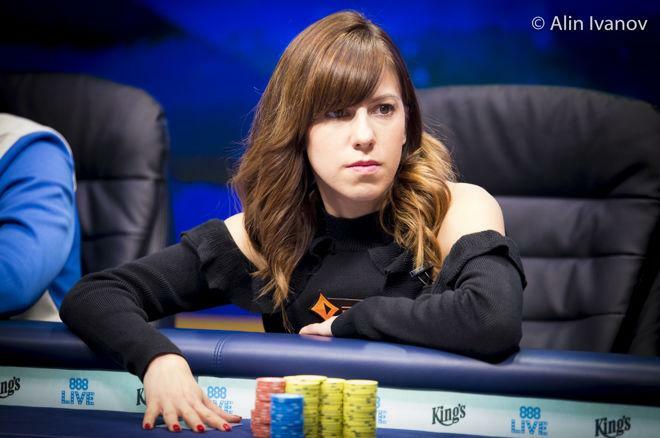 The lineup included 2017 GPI Player of the Year Kristen Bicknell, 888poker team pro Sofia Lovgren, Melanie Weisner, Kitty Kuo, Tracy Nguyen as well as female poker legends Kathy Liebert and J.J. Liu. Of the seven, only Weisner and Liu had made PAD appearances back in the show’s first run, so it would be a new experience for most. The first day saw no shortage of bluff attempts and chip-migration around the table and Bicknell proved that she came to play, though she wasn't the only one. Bicknell coolered Liu for her remaining $7,200 in a queens-versus-aces situation. After getting it in on the flop, Bicknell kindly offered they run it twice and after no queen on either run-out, Liu joked that they should run it some more times. Bicknell and Nguyen squared off in one of the biggest pots of the day in a blind versus blind situation. After $5,600 went in preflop, Nguyen with and Bicknell with , both players connected on the flop. Nguyen opted for the check-raise to $6,400 after Bicknell bet $2,000 with her top pair, top kicker and Bicknell called. The turn completed Nguyen’s nut-flush draw and she led out $11,400. Bicknell called with an effective stack of $44,000 behind. The river paired the board and Nguyen put out a rather small bet of $12,400. Bicknell moved all in, putting Nguyen to a big decision, but she eventually called correctly, prompting a re-load from Bicknell. With the help of that big hand, Nguyen finished the night as the big winner, booking more than $60,000 in profit. On Day 2, Lovgren and Weisner got involved in a pot that bloomed to over $65,000. On a flop of , Lovgren led out for $2,500 from the small blind with and Weisner just called from early position with for top set. The turn gave Lovgren a straight and she bet $5,000. Weisner called again, needing the board to pair. Pair it did with the river and Lovgren thought for a while before moving all in. Weisner made the easy call for her remaining $23,100 with top boat and got a full double. Weisner’s good run continued in another hand where Nguyen had raised with , Bicknell three-bet to $2,000 in the cutoff with and Weisner four-bet to $6,500 on the button with . Nguyen put in a five-bet to $14,900, Bicknell folded and Weisner called with effective stacks of $57,000 behind. The flop came giving Weisner the top full house once again and both players checked. Nguyen bet out $6,000 on the turn and Weisner flat-called. The river was the and Nguyen bet $23,200. Weisner moved all in and Nguyen let it go. Weisner’s stack was well over $100,000 after that pot and she added to that when she called down Liebert’s triple-barrel bluff on a board of with pocket queens. You can watch the hand in the clip below in what may have been the hand of the week. Weisner and Bicknell both ended the session over $100,000 in the black and several players expressed enjoyment about the experience. Stay tuned for more from PokerGO as they continue to provide loads of exciting poker content for your viewing pleasure. If you don't have a subscription yet, you can purchase one here.